The radiation phone app that comes with our D3S PRD and ID has been designed to make it easy to use and clearer to see what is going on. The centre of the screen shows the gamma dose rate and neutron count, making sure the user can not miss this vital information. Once a source has been identified the alert showing the source pops-up in a box at the top of the screen. The box shows the isotope detected and its classification. 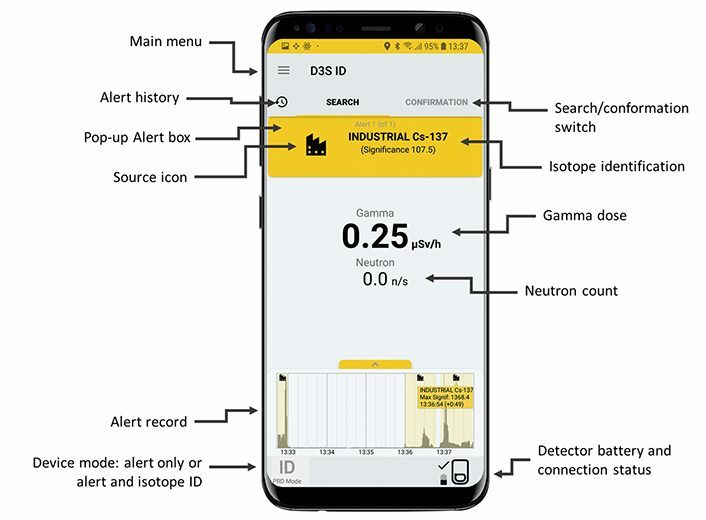 The alert box shows you how many alerts you have and allows you to swipe through them if the detector has identified more than 1 isotope. The phone also vibrates and announces the alert and isotope, this is easy turn silence with one click on the main menu (top left). The alert box will prompt the user to move to confirmation mode (on D3S ID). Confirmation mode is one click away. A time graph is available, showing the count rate trends of the last five minutes of the search mode scan. This can be hidden until you want to see it by using the yellow swipe bar at the bottom of the screen. Highlights and spikes in the graph clearly indicate a radioactive source detection. The icon indicates the classification of the identified source, which can be clicked to reveal additional details of the identification. The clock icon to the left of SEARCH allows the user to see a list of past alert history, showing up to 100 most recent alerts, of which 50 can be from Confirmation Mode scan result. The app screen can now be switched to a dark mode which some users prefer rather than a bright white screen. It also makes the screen more discreet when used at night as well as reducing phone battery consumption. The status of the D3S detector unit is more visible and easier to understand. The icons in the bottom right show detector battery status and that the two devices are connected. Confirmation mode is easy to use. It gives the user help to get the best scan available, with a bar showing if the detector should be moved closer to the source, as wells as instructions on the confirmation scan process. Reachback has an on-screen checklist that walks the user through the process, prompting them for measurement of the suspect item, background measurement and site photo. The user can also type any other relevant information in the report and with one click select to share the report for adjudication.